Author contributions: Haga Y, Kanda T, Sasaki R, Nakamura M, Nakamoto S and Yokosuka O solely contributed to this paper. Conflict-of-interest statement: All authors have no conflict of interest statement. Nonalcoholic fatty liver disease (NAFLD) including nonalcoholic steatohepatitis (NASH) is globally increasing and has become a world-wide health problem. Chronic infection with hepatitis B virus or hepatitis C virus (HCV) is associated with hepatic steatosis. 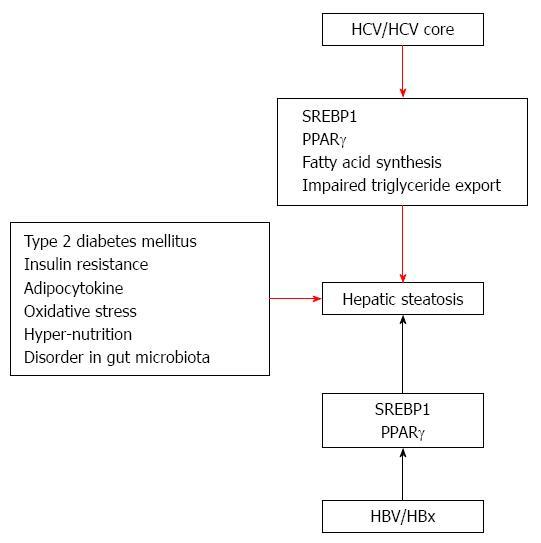 Viral hepatitis-associated hepatic steatosis is often caused by metabolic syndrome including obesity, type 2 diabetes mellitus and/or dyslipidemia. It has been reported that HCV genotype 3 exerts direct metabolic effects that lead to hepatic steatosis. In this review, the differences between NAFLD/NASH and viral hepatitis-associated steatosis are discussed. Core tip: Nonalcoholic fatty liver disease (NAFLD) including nonalcoholic steatohepatitis (NASH) is a common liver disease in United States, European and Asian countries. NAFLD and NASH are associated with metabolic syndrome including obesity, type 2 diabetes mellitus and/or dyslipidemia. Hepatitis C virus (HCV) infections are associated with hepatic steatosis, type 2 diabetes mellitus, insulin resistance and cardiovascular related diseases. In comparison with HCV, the association between hepatitis B virus and steatosis remains unclear. Further studies about the mechanism of hepatic steatosis in viral hepatitis are needed. Nonalcoholic fatty liver disease (NAFLD) is histologically defined as the accumulation of more than 5% to 10% fat in liver without any primary cause such as viral hepatitis, alcoholic liver disease, or drug-induced liver injury. NAFLD is the most prevalent chronic liver disease, affecting up to 30% of the population in the United States and European countries. In other countries, the prevalence of NAFLD varies from 6% to 35%. The prevalence of NAFLD is increasing as the prevalence of metabolic syndrome including obesity, type 2 diabetes mellitus and dyslipidemia is increasing around the world. NAFLD represents a histopathological spectrum ranging from steatosis alone to steato-fibrosis with inflammation or necrosis, which is also called nonalcoholic steatohepatitis (NASH). Patients with NASH have an increased risk of liver fibrosis, cirrhosis, and hepatocellular carcinoma (HCC). Intensive following up is needed for patients with NASH. It has been reported that the prevalence of hepatic steatosis is approximately 40%-85% in hepatitis C virus (HCV)-infected patients. Yasui et al reported that hepatic steatosis was present in 171 (57%) of 297 patients with chronic hepatitis C in Japan. Histological study revealed that the median prevalence of hepatic steatosis were 3.8% and 2.2% in chronic HCV-infected Japanese patients with or without visceral obesity, respectively. From Taiwan, 52% of Chinese patients with chronic hepatitis C had hepatic steatosis. In Mainland China, the prevalence of fatty liver detected by ultrasound were 10.5%, 11.4% and 38.5% in patients infected with HCV genotype 1, 2 and 3, respectively. Recent reports from Beijing, China showed that 36 (30%) of 120 patients with chronic hepatitis C presented with hepatic steatosis (≥ 5%). Patients with chronic HCV and hepatitis B virus (HBV) infections number approximately 170 million and 400 million, respectively[8,9]. Approximately 75% of HBV carriers reside in Asian-Pacific countries. As the number of patients with metabolic syndrome is increasing, the number of patients with NAFLD/NASH or hepatitis-associated steatosis is also increasing. It is well known that several effects of steatosis on the pathogenic pathways in the liver could lead to clinical differences such as in the response to antiviral therapy. In this review, we discuss the differences between NAFLD/NASH and hepatitis-associated hepatic steatosis. NAFLD has been associated with metabolic syndrome, and insulin resistance is an intrinsic defect in NAFLD. The World Health Organization and National Institutes of Health define obesity as ≥ 30 BMI. In 2009-2010, the prevalence of obesity was 36% and 36%, respectively, in adult men and women, with no significant change compared with 2003-2008. Masters et al reported that there is a substantially strong association between obesity and mortality risk at older ages, and an increasing percentage of mortality is attributable to obesity across birth cohorts. Thus, obesity significantly shapes United States mortality levels, placing it at the forefront of concern for public health action. A more precise definition of obesity may be necessary in the Asian population because they have low tolerance against metabolic syndromes such as obesity. The prevalence of metabolic syndrome in Japan was found to be 44% and 29% in men and women, respectively. In the United States, 46% and 12% have NAFLD and NASH, respectively. Globally, 27% and 30% of cirrhosis is due to HCV and HBV infection, respectively, and 25% and 53% of HCC is due to HCV and HBV infection, respectively. Patients infected with HCV have high prevalence of steatosis. It was reported that 48% of HCV-infected patients show steatosis, and a higher prevalence has been observed in HCV genotype 3a infections. HCV infections are associated with hepatic steatosis, type 2 diabetes mellitus, insulin resistance and cardiovascular related diseases (CVD). In comparison with HCV, the association between HBV and steatosis remains unclear. Peng et al reported that hepatic steatosis is more frequently present in chronic hepatitis B patients than in the general population. In contrast, Wang et al reported that chronic HBV infection was not associated with insulin resistance or hepatic steatosis. Metabolic syndrome is a risk factor for steatosis in HCV patients. However, metabolic syndrome seems less likely to be present in hepatitis B surface antigen (HBsAg)-positive patients compared with non-HBsAg carriers. Further studies may be needed. NAFLD and NASH are associated with insulin resistance, atherogenic dyslipidemia and increased CVD independent of traditional risk factors. Moreover, NASH-cirrhosis and type 2 diabetes mellitus contribute to increasing CVD in liver transplant recipients. HCV-associated metabolic syndrome, featuring steatosis, hypocholesterolemia and insulin resistance, also appears to be associated with substantially increased CVD. On the other hand, HBV infection is generally independent from insulin resistance, steatosis and CVD. Day et al presented a “two hit theory” of the etiology of NASH. In their theory, fat initially deposits at hepatic cells. Next, various factors induce hepatic injury to the liver, leading from NAFLD to NASH. Tilg and Moschen propose a multiple parallel hits hypothesis. In fact, it may be very difficult to distinguish among the various causes. These factors include insulin resistance, impaired secretion of adipocytokines, oxidative stress, hyper-nutrition and disorder in the gut microbiota (Figure 1). On the other hand, some mechanisms of steatosis in HCV infection have been reported. Moriya et al reported that an increase of unsaturated fatty acid induces hepatic steatosis. HCV core protein synthesizes sterol regulatory element-binding protein-1 (SREBP-1). Oxidative stress is also induced under conditions of increase unsaturated fatty acid. A decrease in the secretion of very low density lipoprotein (VLDL) is another cause of steatosis. Eslam et al reported that a single-nucleotide polymorphism (rs12979860) in the intron of interferon-λ4 is a strong predictor of fibrosis in an etiology-independent manner. The impact of rs12979860 genotypes on fibrosis is maximal in young females, especially those with HCV genotype 3. These findings establish rs12979860 genotype as a strong etiology-independent predictor of tissue inflammation and fibrosis. Figure 1 Mechanisms of hepatic steatosis induced by viral and non-viral pathways. HBV: Hepatitis B virus; HBx: Hepatitis B X protein; HCV: Hepatitis C virus; SREBP1: Sterol regulatory element-binding protein-1; PPARγ: Peroxisome proliferator-activated receptor gamma. In the case of HCV infection, there are two pathways: viral and non-viral. In HCV patients, not only metabolic syndrome but HCV, especially genotype 3, which exerts direct metabolic effects, leads to liver steatosis. HCV genotype 3a up-regulates the expression of fatty acid synthase HCV-infected hepatocytes up-regulate the synthesis of more fatty acids, impair β-oxidation of the available fatty acids, and impede the export of triglycerides. HCV decreases mitochondrial β-oxidation, possibly due to mitochondrial damage. Release of HCV particles from hepatocytes utilizes the same pathway used in VLDL export, and HCV mediates inhibition of the microsomal triglyceride transfer protein (MTP), a molecule involved in export of triglycerides from hepatocytes. Several viral proteins of diverse HCV genotypes interfere with insulin signaling, leading to insulin resistance. Sterol regulatory SREBP-1c enhances transcription of genes required for fatty acid synthesis and predominates in the liver. It has been shown that HCV core protein transcriptionally activates peroxisome proliferator-activated receptor gamma (PPARγ), although it exerts no effect on PPARγ gene expression. The expression of pro-inflammatory mediators and liver X-receptor-regulated lipogenic genes is enhanced in non-alcoholic fatty liver disease and hepatitis C. Singal et al reported that patatin-like phospholipase domain-containing 3 (PNPLA3) is associated with an increased risk of advanced fibrosis among patients with a variety of liver diseases and is an independent risk factor for HCC among patients with NASH or alcohol-related cirrhosis. However, Nakamura et al reported that no association between PNPLA3 rs738409 genotype and fatty change of the liver or hepatic cirrhosis was found in Japanese patients infected with HCV. The impact of HBV on steatosis is still controversial. HBV X protein can lead to lipid accumulation in hepatocytes; apolipoprotein B secretion is inhibited and PPARγ and SREBP-1c are induced through its direct interaction with either liver X receptor α (LXRα) or tumor necrosis factor (TNF) receptor 1 leading to nuclear factor-kappa B activation and TNF production. Ludwig et al proposed the concept of NASH and its histopathological features, which are steatosis, ballooning of hepatocytes, fibrosis, lobular inflammation and Mallory-Denk bodies. Steatosis is one of the main histological features of NAFLD/NASH. Histological steatosis is not absolutely necessary in a diagnosis of NASH. For example, it is difficult to diagnose burned-out NASH. In a case of burned-out NASH, fat flows out from the hepatocytes as VLDL, and the unsaturated fatty acid occasionally decreases. Down-regulation of SREBP-1c and lipogenic enzymes is also associated with burned-out NASH. In the NAFLD activity score (NAS), cases with a high grade of inflammation activity and hepatocyte ballooning without evidence of steatosis can be diagnosed as borderline disease. Brandman et al confirmed the presence of a certain degree of steatosis in nearly 30% of HCV patients. Among NAFLD/NASH patients, steatosis is pan-acinar or predominantly in the centrilobular zone (acinar 3). Zubair et al reports that the localization of steatosis in HCV patients is similar to that in NAFLD/NASH patients. On the other hand, Basaranoglu et al reported that the localization of steatosis, particularly in HCV genotype 3-infected patients, is predominantly in the periportal zone (acinar 1) and not in the centrilobular zone (acinar 3). Most cases of NAFLD are asymptomatic. Liver steatosis is incidentally discovered in thoracic and abdominal imaging examinations or blood tests. The imaging evidence for NAFLD is as follows: hepatorenal-contrast on ultrasonography, low density pattern of the liver on computed tomography, or low signal on T1 weighted magnetic resonance imaging. With transient-elastography, fibrosis is overestimated in HBV-infected patients by severe/moderate necroinflammatory activity and in HCV-infected patients by severe/moderate necroinflammatory activity and/or severe/moderate steatosis. Therefore, additional attention should be paid to liver stiffness in HCV-infected patients with hepatic steatosis using transient-elastography. In the case of NASH, the number of serum platelets decreases as the fibrosis advances. In the case of HCV infection, platelet counts also decrease. Compared with HCV infection, this effect is milder in NASH. When we see erythrocytosis, we should suspect the co-existence of sleep apnea syndrome. An increased aspartate transaminase (AST)/alanine transaminase (ALT) ratio is occasionally associated with fibrosis. Ferritin is correlated with hepatic fibrosis. Hyaluronic acid and type IV collagen are correlated with chronic fibrosis. Insulin resistance is associated with the homeostasis model assessment ratio (HOMA-R). Adiponectin, leptin and TNF-α are correlated with inflammation. Cytokeratin18 is good biomarker in HBsAg-positive patients; with an undetectable viral load, hepatic steatosis is the main cause of elevated aminotransferases. Mac-2 binding protein levels in clinical practice may also be useful as a biomarker for NASH. Steatosis has a negative impact of the outcome of interferon-based therapy for eradication of several genotypes of HCV[42,43]. In non-diabetic patients with chronic HCV, the achievement of sustained virological response (SVR) with peginterferon and ribavirin prevents the development of de novo insulin resistance. Treatment failure is significantly associated with the development of de novo insulin resistance. Recent research has indicated that achieving SVR with an interferon-based regimen prevents the development of insulin resistance, whereas treatment failure is an independent risk factor for the de novo development of insulin resistance. In patients with chronic hepatitis B, the impact of steatosis on response to antiviral treatment with either peginterferon alpha-2a or the combination of peginterferon alpha-2a plus lamivudine has been poorly studied. Cindoruk et al reported that no association between steatosis and response to interferon-based therapy was observed. On the other hand, Ateş et al reported that hepatic steatosis leads to a trend of decreased, but statistically insignificant, SVR rates to peginterferon treatment. Hepatic steatosis is significantly associated with entecavir treatment failure. Some nucleic acids have been reported to induce steatosis as a result of cell injury. Lactic acidosis and severe hepatomegaly with steatosis may also occur during therapy with the anti-hepatitis B drug fialuridine or adefovir dipivoxil. The treatment for HCV is shifting from interferon-based therapies to interferon-free therapies with Direct-antiviral agents against HCV (DAAs). The impact of steatosis on DAA treatment is still controversial. Meissner et al reported that clearance of HCV using an interferon-free antiviral regimen of sofosbuvir and ribavirin results in rapid changes in peripheral and intrahepatic metabolic pathways such as increased serum LDL concentration and decreased triglyceride concentration. At present, we do not know whether DAA treatment could improve type 2 diabetes mellitus or insulin resistance in HCV-infected individuals. Infectious HCV replication and assembly is closely associated with intracellular lipid droplets and production of VLDL. HCV particles are co-assembled with VLDL, the main structural component of which is apolipoprotein B (apoB). HCV particles in the sera exists as a mixture of complete low-density infectious lipo-viral particles (LVP) and a vast excess of apoB-associated empty nucleocapsid-free sub-viral particles that are complexed with anti-HCV envelope antibodies. The difference in LVP correlations in HCV genotype 3 compared to HCV genotype 1 suggests HCV genotype-specific differences in apoE mediated viral entry. These facts indicate the importance of the association of steatosis between HCV and NAFLD. Several lipid-modulating drugs already in clinical use and in development for other diseases such as statins, niacin, plasma cholesteryl ester transfer protein inhibitors, apoB antisense and miRNA-122 inhibitors are useful for HCV treatment as indirect-antiviral agents against HCV (IDAA). Entry inhibitors such as scavenger receptor (SR)-BI antagonists, and novel target inhibitors such as diacylglycerol acyltransferase 1 inhibitors and long chain acyl-CoA synthetase 3 inhibitors may also be useful as new IDAA treatment options. Many pathways are involved in liver steatosis and steatohepatitis. Accompanying the high prevalence of metabolic syndrome and liver steatosis, health problems are arising. As shown in this article, we reviewed characteristics of steatosis, the several viral and non-viral metabolic pathways that lead to steatosis and the management of NAFLD/NASH and steatosis with viral hepatitis.